The Ministry of Local Government has said that it will construct civic centres in all Seven constituencies in Lusaka to decentralise the operations of the main Lusaka civic centre. 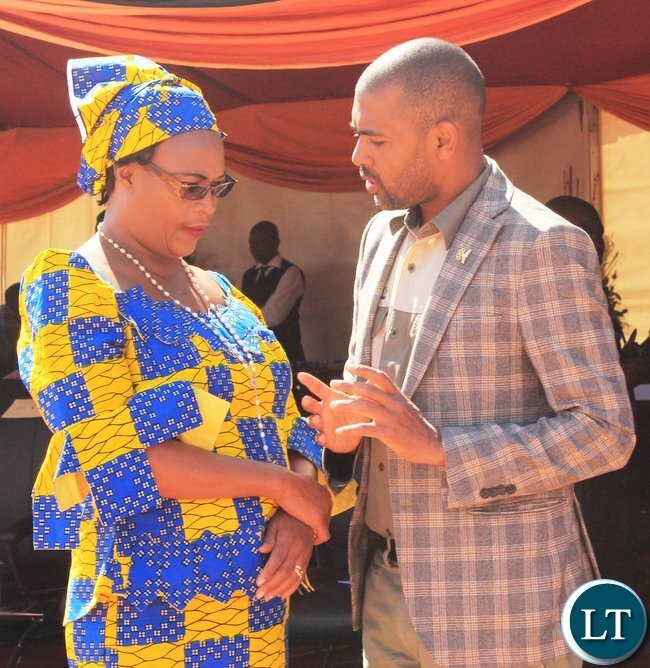 Minister of Local Government Vincent Mwale says that the development was reached during a cabinet meeting that was held on Monday at State House. Speaking at the official opening of Kaunda Square stage one market constructed by the Zambia National Service today, Mr. Mwale explained that the current civic centre is not adequate to cater for the growing population in the city. The Local Government Minister said the construction of the seven-constituency civic centres will start next year. ZNS Commandant Lieutenant General Nathan Mulenga said the service is remains committed to delivering quality works. Munali Constituency Member of parliament Professor Nkandu Luo has urged the marketeers to desist from acts of vandalism. Meanwhile, Mitete District Council in Western Province has called on councilors to sensitize people in their wards on government programmes and projects being undertaken in the district. Mitete District Council Chairperson, Patrick Mikosa said councilors should take their positions of leadership seriously in order for them to execute thier duties effectively. Mr. Mikosa emphasized that it was the responsibility of councilors to adequately sensitize people in their wards on all developmental projects and programmes taking place in the area. He said this during a full council implementation sensitization meeting in Mitete district aimed at educating the public on the role of councilors in supporting government projects. Mr. Mikosa added that continued sensitization programmes by councilors will accelerate the community’s response towards the implementation of government projects. He stated that the project of drilling boreholes in Mitete district required the community’s contribution of K 1,500 towards completion. Mr. Mikosa urged the councilors to continue sensitizing the community on the importance of mobilizing funds for speed implementation and completion of such projects. He further stated that it was important for the community to contribute a certain amount of money for the maintenance of boreholes in the region. The newly created Districts do not have offices. People work under trees. Let’s get our priorities straight. Politics of appeasement don’t bring calculated and planned development. This is chipantepante! The thugs don’t yet seem to appreciate the country is bankrupt and even Shylocks won’t give them a cent. Another loan from China, over-priced contract is to be given to Chinese contractor who will use chinese labour & cheap local labour while remain with $millions in Debt & Chinese take over our country. Do youyou have the cash and is also a project thate will be funded by borrowed money from maybe China or an anticipation of TAX revenue,…….messed up vision. Let me guess all these centers will be contracted by Chinese firm Avic….there is nothing of substance that come out from these empty tins apart from increasing expenditure, the have absolutely no policy to increase GDP. Looks like the chinese have won the lottery again, its like they are the ones telling pf when to build and where to build. The Chinese do the feasibility studies tell PF its going to cost so much with extra cherry on top for Lazy …PF takes the loan request proposal to Chinese govt; Chinese govt instructs China Exim Bank to release funds…PF choose Chinese Construction company of their choice; everyone is a winner except the taxpayer. They will cost ten times the market value. Eish ,Misisi ,Chobolya ,Chawama needs tarred roads ,schools and tap water not damned civic centers naimwe.Priorities ,priorities my people beat back poverty and improve living conditions 1st . UPND cadres up here can never appreciate anything. all you ever do is complain. What credit, they cant deliver much need services, now want to add unnecessary costs. What will they be doing in those offices? Your friends are investing in technology which can be mobile and scaled when need arises. You want civic centres so Davis Mwila can use them for his silly PF meetings!! Upnd cadres and their tonga leaders are anti-development!! !DO YOU KNOW WHY?they know too well that the more PF Govnt deliver developmental projects across Zambia,the more their tonga god HH is pushed away from state house!! !so Govnt should ignore Kambwili and HH’s followers 100%!!! Zambian voters shall judge PF works in 2021 as they did in 2016!! Really only a tribal fo0l cannot see PF projects which are dotted all over Zambia! !KEEP IT UP ECL AND WE SHALL SURELY REWARD YOU WITH MASSIVE VOTES IN 2021!! I saw the new Kaunda square market-hey it is looking very nice!! Build in new districts and please let’s hear something about your plans for a growing the economy. Pf cadres put their chitenge at the bus station in Mansa and chased a Kawambwa based transporter out of the station for allegedly funding NDC. Chipili independent MP went and removed the pf flags saying that we were not in campaign time and that the station was a public place which did not belong to pf. The MP has been arrested and is in police custody in Mansa. Maybe because it’s not his constituency, but maybe acted as a concerned Zambian. No trial and error on governance! Winangu afuna kugurisa ziko. Chronic loser may try Hagain in 2026! When was the last time you went to the Civic Centre in Lusaka? This project is long overdue. As regards how it will be funded,the report above doesn’t say. Because we don’t know how the project will be funded,its unpatriotic to start saying negative things. Let us support development of infrastructure . That’s because a loan is on the way …PF has no money to fund this from Ministry of Finance; they are failing balance to books!! It’s not just infrastructure for the sake of it. But priority infrastructure. Why can’t you improve on housing and status of shanties so that cholera stops? This is a question of priority infrastructure and also priority economic sectors that will bring spin offs. Try to fund them with Paradise stolen money. We are not surprised UPND cadres, TONGAS in particular, don’t want to hear about any development news, these guys will not appreciate whatever the government is doing, provided their god HH is not in the state house. Unfortunately for them, we know their main agenda is to have a TONGA as a republican president at all costs so they will continue blackmailing all the development projects undertaken by the government. This is uncivilized way of doing politics, give credit where it is due and criticize constructively and not destructively. Mind you, Zambians are watching your attitude towards the government, and how can they vote for your supreme god, wamuyayaya, HH, with this anti-government strategy to gain cheap political mileage, NO WAYS. Civilisation demands that you keep tribalism out of development, try it in your home and see if you wife will allow ubufuntine bobe. WHAT ABOUT IN MUSHINDAMO DISTRICT, WHICH WAS DECLARED DISTRICT IN 2015. BUT NOTHING IS HAPPENING UP TO NOW IN THAT DISTRICT. This is being too ambitious, it’s a good move though. They can start with 3 civic centres in Matero,Chawama and Munali constituencies.